I first came across Cynthia Rylant's writing through the Henry and Mudge books when my children were learning to read. When they were ready for longer books, we found several books by Cynthia Rylant that seemed safe, yet still new and interesting, to my blossoming readers. Gooseberry Park by Cynthia Rylant was a favorite for both my young readers. Gooseberry Park is a wonderful story for children moving from beginning reader books to chapter books. Arthur Howard's black and white illustrations appear at the beginning of each chapter, and are scattered throughout the pages - visually breaking up the text, but still giving the reader a sense of reading a real chapter book. Kona is a chocolate Labrador who lives with wise hermit crab named Gwendolyn and a retired biology professor. The professor and Kona frequently visit nearby Gooseberry Park where Kona's good friend lives in an oak tree - a red squirrel named Stumpy who has just had babies. One day a storm with freezing rain hits the area, coating everything in a thick layer of ice, and leaving downed and broken trees in Gooseberry Park. Kona makes his way to the park to check on his friend and her family, and finds the oak tree broken on the ground, Stumpy missing, and a bat (named Murray) taking care of the squirrel babies. Kona and Murray hide the baby squirrels in the professor's house to keep them safe and warm. Kona then faces the challenge of reuniting Stumpy with her babies, and of hiding the babies and Murray, who likes to snack on Oreos and other treats, from the professor. 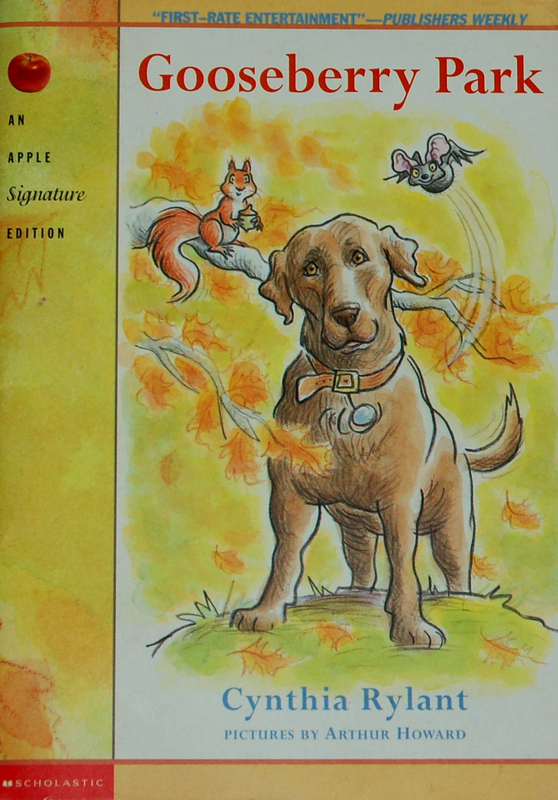 Eventually, with the help of Gwendolyn and Murray, Kona comes up with a plan - involving weasels, rumors, and a glowing watch - that gets a message to Stumpy and shows her the way to the professor's house. Gooseberry Park is a story about friendship, and courage. Rylant takes readers on this adventure with warmth and plenty of humor. Two paws up rating.